Pempelfort and Derendorf are high energy neighborhoods with a lot to offer – and since they’re quite close to one another they’re also easy to explore. Whether you’re searching for independent shopping, food, drinks or experiences you’re sure to find something great here. Are you ready to find some new favorites? Let’s go! There are always more than 20 excellent coffee and espresso varieties to choose from at Die Kaffee, a popular private coffee roastery in Pempelfort. The roastery features plenty of comfy indoor seating and offers online ordering. Take a break and relax for a while at Roasted Kaffeebar, a cosy coffee bar serving tasty homemade drinks such as fresh brewed coffee and cappuccino, plus a small selection of cakes. Café Calu offers a variety of specialty coffees and freshly roasted coffee beans. Enjoy Iced Lattes, sandwiches, homemade cakes and, from mid- May, frozen yogurt – in the café or on the sunny terrace. Also serves a breakfast buffet on Sundays from 9-14. Café Carrot/Cake offers a range of vegan cakes, pies and other goodies that changes daily, plus various coffee specialties. On weekends you can enjoy a delicious breakfast as well. Taste the culinary delights of Asia – from Thailand and Vietnam to Japan at VIVU – Der Asiate. Dishes are glutamate-free, made with fresh ingredients and cooked to preserve vitamins. Selected wines, Asian beers, cocktails and teas round out the menu at this cosy restaurant. Restaurant Spoerl Fabrik is a modern crossover kitchen with Mediterranean, Oriental and Asian influences, located in the beautiful courtyard of a historic factory. Meet here for breakfast, lunch and dinner, or simply drop by for coffee & cake in the afternoon or a couple of drinks at night. Come together, relax and enjoy yourself – that’s what Le Bouchon is all about. Offers carefully selected French wines, cremant, champagne, and entrees that change monthly. Casita Mexicana has been serving authentic, fresh & original Mexican Street Food since 2010. Enjoy tasty homemade tacos, burritos, quesadillas, guacamole, changing specials and more. Serving a wide variety of tequilas, cocktails & beer. CURRY has been serving sausages by a star cook, fries made from fresh potatoes and a range of sauces in a modern ambiance since 1999. A good selection of wine is available, as are trendy drinks, champagne and a terrace. Squarebar serves handcrafted cocktails made from homemade ingredients in a bar with Old-World charm. David Rippen and his team craft everything from creative drink classics to seasonal originals with surprising ingredients such as alcohol-macerated herbs & fruit. roberta specializes in urban fashion that’s fair and ecologically produced. Here you’ll find carefully curated labels featuring minimalist design without frills. For women and children. At noirblanche everything revolves around curated photography and modern, international design for the home. Noirblanche presents its unique concept in a beautiful old colonial shop in the immediate vicinity of the new HSD campus. Goldschmiede Atelier Lisa Ueno is located in a cozy courtyard studio in Derendorf. Here unique pieces of jewelery are carefully and lovingly handcrafted by an expert goldsmith. Creative types can even give it a try themselves by taking part in one of the popular courses. After exploring the city, why not treat yourself to some rest and relaxation? In The Pink is a unique natural cosmetics institute specializing in professional, holistic facial care using organic and certified natural cosmetics in a beautiful atmosphere. The main focus here is on your well-being. P.S. 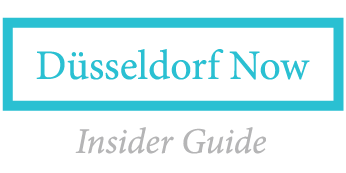 If you liked this, then check out our other guides for Pempelfort/Derendorf, Altstadt/Carlstadt and Flingern.